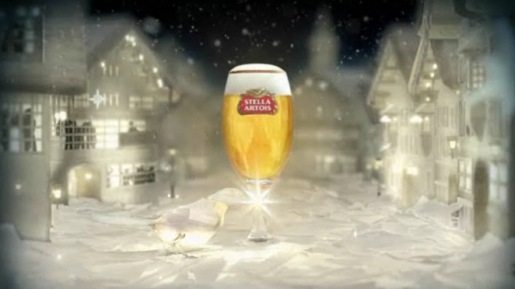 Stella Artois is helping beer drinkers cut out their own small piece of Christmas. As part of a campaign by Toronto-based Lowe Roche, in collaboration with London-based Lowe Worldwide, consumers can go to a Christmas-ized stellaartois.com and download printable paper ornaments to decorate their homes. The campaign is being promoted with an online video, “Dove”, showing a craftsman at work bringing a dove to life. The microsite houses a video featuring a craftsman putting the finishing touches on a paper dove. In grand storybook tradition, it comes alive after he retires for the night and delivers a paper star to a pint of Stella sitting amid a magical paper town, punctuated by the campaign tagline, “Originally crafted for Christmas.” A modified version of the spot is airing on television in the U.S. The effort plays off Stella’s heritage as a Christmas beer (the name Stella refers to the Christmas star). It draws from paper-fashioned imagery introduced through an OOH campaign that ran in the U.K. in the summer, reinforcing Stella’s identity as a meticulously crafted brew. “The paper ornament idea lends itself to Christmas, so it became the perfect fit,” explains Christina Yu, VP/CD at Lowe Roche. In the spirit of holiday fellowship, microsite visitors can send friends customized invitations, delivered by the paper dove, to gather over a pint of Stella at a favourite pub. “Our idea is to bring people together to celebrate the season,” says Yu. The Dove campaign was developed at Lowe Roche/Lowe Worldwide by worldwide creative director Matthew Bull, creative director/art director Christina Yu, art director Patrick Shing, copywriters Joseph Bonnici, Rob Sturch, business management team Anna Crabtree and Oliver Clark, producer Dan Heighs, digital production director Trisha Quenneville. Filming was shot by creative directors Eben Mears and Marco Spier via Stink and Psyop, with executive producers Mungo Maclagan (Stink), Boo Wong (Psyop), producer Carol Collins (Psyop), director of photography Darran Tiernan, designer Kimberly Dulaney, editors Cass Vanini, Graham Brennan, storyboard artist Ben Chan, lead technical director Tony Barbieri, lead compositor Molly Schwartz, 3D team Gooshun Wang, Lee Wolland, Cody Chen, Jeff Lopez, Miguel A. Salek, 3D look and development Marco Iozzi, compositor Cody Chen, Flame artist Mark French, assistant Flame artist Dan Boujoulian, lead Roto artist J Bush with tracking by Steven Hill. Music was composed by Paul Leonard-Morgan. Sound was designed by Ben Gulvin at 750mph, London.